As the rain was starting to lessen in areas of Southeast Texas initially impacted by Tropical Storm Harvey, carriers reported few cell tower sites out of commission on Wednesday. Of the 55 impacted counties in Texas and Louisiana, 4.2 percent of the cell sites were out of service, down from 4.7 percent on Tuesday, according to the FCC’s Disaster Information Reporting System (DIRS). Tropical Storm Harvey continued to deluge southeastern Texas with rain and surging floodwater Tuesday, as it slowly crept toward Louisiana. A major dam outside Houston, the nation’s fourth-largest city, overflowed, resulting in more flooding. About 95 percent of the cell tower sites in the 55 total counties of Texas and Louisiana are working, according to the latest figures from the FCC’s Disaster Information Reporting System (DIRS). The carriers provide updated information to DIRS daily. The nation’s major wireless carriers, Sprint, AT&T, Verizon and T-Mobile, are offering free calls, text, data and credits for customers affected by Tropical Storm Harvey. Sprint is waiving casual call and text fees for Sprint, Boost and Virgin Mobile customers in the impacted areas of Texas and Louisiana through September 1. AT&T has a similar plan. Until at least September 1, the carrier will issue credits to AT&T wireless customers in impacted areas for additional data, voice and text charges, and AT&T Prepaid for additional voice and text charges. Verizon is offering free service to monthly subscribers in the affected area until September 8. As Hurricane Harvey set its sight on the Texas and Louisiana coasts, carriers employed strategies to keep wireless technologies that keep people in touch and critical systems online. As the storm advanced, preparation included topping off fuel generators, testing high-capacity back-up batteries at cell sites and protecting physical facilities against flooding. Sinclair Broadcast Group and Tribune Media call allegations that their combined power after their $3.9 billion merger would allow the new entity to delay the television channel repack, “absurd and unfounded.” They defend their planned deal, asserting their need to combine to survive the competitive media landscape. “Each of the petitioners is either trying to use this proceeding to stifle competition for its own economic interests, or is still living in a pre-cable, pre-internet, pre-smartphone world, untethered from the economic realities of the current media market,” said both companies in a response to Petitions to Deny filed with the FCC late Tuesday evening. here was a time, long ago, in a United Kingdom far away where telcos, happy because they were free at last to compete, mostly did what they were told by their stern but fair government regulator, Ofcom, without rushing off to the local magistrate to quibble over any injustice they felt intruded on their happy state of affairs, according to TelecomTV. Those days, alas, are apparently long gone. The regulator has become the referee and protector of the public interest, blowing a tinny-sounding whistle, only to be mobbed by screaming players, i.e., the carriers. Two years ago, the CEO of British Telecom (BT) openly threatened Ofcom with ten years in court and a veiled infrastructure build strike when it felt it had been wronged. Now Ofcom faces another, and possibly bigger issue, but this time it’s about 5G spectrum and who can hold what percentage of it. The biggest spectrum holder is BT, and the smallest, Hutchison’s 3G ( “3” ), with O2 and Vodafone somewhere in between. President Donald Trump issued an executive order establishing accountability in the environmental review of infrastructure projects, including broadband. The order creates a framework to ensure the permitting process is “coordinated, predictable, and transparent,” according to the text. AT&T uses drones for tower inspections. Actually, vendors do that work for the carrier. Now, the carrier wants to start automating the process using artificial intelligence. “At any point in time, we’re installing, repairing or inspecting one of our 65,000 cell towers,” says Mazin Gilbert, Vice President of Advanced Technology at AT&T Labs in a blog. The video analytics team at AT&T Labs is working with the company’s National Drone Team on the concept. Exactly Who Gets Priority Access to FirstNet? Public safety personnel who take calls from the public, dispatchers and others will have priority access to FirstNet, the nationwide public safety communications network. While AT&T officials have said they plan to give first responders from states that have opted into FirstNet “presumptive access” on their LTE networks by the end of the year, officials explained more about what that entails at the APCO 2017 show this week in Denver. The Competitive Carriers Association objects to the proposed transfer of millimeter wave spectrum from Straight Path Communications to Verizon as part of a proposed all-stock transaction the parties value at just over $3 billion. The telcos seek permission to transfer the control of Local Multipoint Distribution Service, 39 GHz, 3650-3700 MHz, and common carrier fixed point to point microwave licenses from Straight Path to Verizon. The FCC’s preliminary review indicates once the deal closes, Verizon would have 100 MHz to 1650 MHz of spectrum in total, in the 28 GHz and 39 GHz millimeter wave bands across the U.S. The Dynamic Spectrum Alliance (DSA) tells the FCC by its count, most of the more than 800 comments filed on proposed changes to the 3.5 GHz band oppose converting the Citizens Broadband Radio Service (CBRS) into a 5G-only band. The DSA characterizes itself as a group of what it says are “multinationals, small-and medium-sized enterprises, and academic, research, and other organizations” committed to expanding broadband. Kathy Gill was nervous, but then she always gets nervous when she goes to prison. This was her fourth time. A woman who had built a company, trained hundreds of men and women to work past their fears and climbed a countless number of towers in all conditions, was wishing she was someplace where she was more comfortable, like dangling from a harness 150 feet in the air. A federal appeals court Monday sided with the FCC, so many of the Commission’s actions to deregulate Business Data Services will take effect. The FCC in April voted to relax what it said were unneeded regulations where competition exists and preserve those where competition is still lacking. By adopting the new framework, the agency hopes to further boost BDS competition and investment, and take steps to decrease the cost of broadband infrastructure deployment, Inside Towers reported. Sprint’s talks with T-Mobile about a potential merger are back on and being held at the same time as discussions with cable companies, those with knowledge of the talks tell Bloomberg. Sprint’s exclusive negotiating period with Comcast and Charter expired, enabling the carrier to resume other discussions. The FCC doesn’t want its patchwork of license renewal obligations for Wireless Radio Services to hinder broadband deployment. That’s why the agency has taken steps to streamline them and establish a consistent standard. The Commission approved a Report and Order and adopted uniform service continuity rules at its monthly meeting last week. The U.S. Senate confirmed two nominees to the FCC on Thursday — Democrat Jessica Rosenworcel and Republican Brendan Carr. FCC Chairman Ajit Pai congratulated them, saying, “As I know from working with each of them for years, they have distinguished records of public service and will be valuable assets to the FCC in the years to come. Their experience at the FCC makes them particularly well-suited to hit the ground running.” The move brings the agency back up to a full complement, yet Pai himself has not yet been reconfirmed to another term, Politico reported. Sprint posted a quarterly profit for the first time in three years — $206 million in net income, compared with a $302 million loss for the same period a year ago; it’s in the middle of a five-year turnaround plan and cut costs by $370 million (to roughly $7 billion) in the second quarter and expects an additional $1.3 billion to $1.5 billion in year-over-year reductions in fiscal 2017. 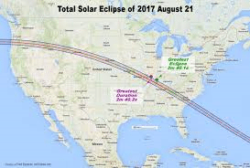 On Monday, August 21, the United States will experience the first total solar eclipse to cross the country since 1918. This once-in-a-century event will create a virtual rolling blackout of cell services as it travels along it’s path, not due to the heavenly bodies but because of the live streaming, photo-taking and subsequent ‘sharing’ done by the terrestrial ones. North American residents will be able to view a partial eclipse, but only certain areas in the U.S. will see the “Great American Eclipse,” making a diagonal cut from the Pacific Northwest to the Southeast seaboard. “We’re expecting a good experience but there will be [peak] times where the network will struggle,” said Paula Doublin, assistant vice president of construction and engineering for AT&T. According to The Bulletin, emergency personnel are concerned with the convergence of a high population in some areas as well, including those in Central Oregon. They fear the towers won’t be able to handle the bandwidth and in the case of an emergency, 911 calls via cell phones won’t be possible. Their plan is to rely on “older” methods of communication – landlines and ham radio operators – to fill the gap.